While a cold home simply feels uncomfortable and uninviting, it can have a negative effect on your health as well.Here are a few common problems that may be impacted by keeping your home too cold! Your mom was right; being cold can be bad for you and can increase your vulnerability to catching colds and flu. When you're cold, your ability to eliminate germs is compromised. Normally, mucus flows into the upper respiratory tract and cleans out the contaminants but lower temperature impair your body's ability to combat airborne villains. Everyone has an ideal internal temperature and it is different for each person and varies when you are awake vs. when you are sleeping. If you are too hot or too cold during the night, your ability to fall asleep or stay asleep may be affected. Test different settings on your thermostat to find the right temperature for your household. A colder home and excessive moisture (think rain, snow, boiling water, hot showers), can create condensation which can lead to mold and mildew in your home. When mold spores land on damp places indoors, they begin to grow. Studies suggest a link between mold and the development of asthma. Most studies agree that mold does trigger asthma attacks and asthma symptoms and indoor dampness also impacts people with the disease. Many people can predict the weather by the aches and pains in their body. 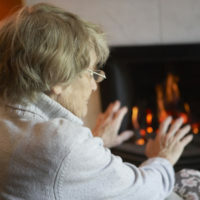 Joint pain related to arthritic conditions be worsened by cold temperatures so keeping the home a bit warmer may be beneficial to those who suffer from daily pain. Cold temperatures tend to raise blood pressure and heart rate. If you already suffer from heart disease, turn up the thermostat a few degrees. Saving a few dollars isn't as important as protecting your health. Take a moment to consider the effect cold temperatures have on you and your loved one’s this year.